My initiation into Bonsai was kind of strange really. I'd never been much of a gardener or anything but managed to keep the grass tidy at my house in Southampton, UK and was always relatively successful with house plants. I had a few days off one summer round about 1997 and I was watching one of those afternoon life-style type shows on TV featuring some celebrity designer. As a final flourish to a Japanese style “outdoor living space” he had created for some deserving couple, (i.e. a patio) he stuck a juniper tree in a fancy pot - did a couple of snips with some shears and produced what he called a Bonsai.“That looks pretty interesting,” I thought, and was hooked. 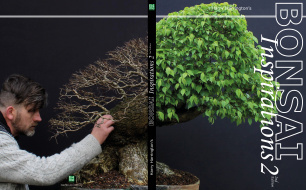 I was even methodical enough to buy a Harry Tomlinson bonsai book but didn’t really absorb it. Instead, I went out, more or less straight away, and started purchasing and then mangling, all sorts of dwarf conifers and shrubs. After some untimely tree deaths I soon realised that there was a bit more to bonsai so I bought myself more books and became slightly more systematic in my approach.My skills and trees have improved to quite an extent over the past 10 years although I still consider myself to be only a knowledgeable intermediate. However, I feel that I’ve always had a good eye for potential bonsai stock. I still have 4 or 5 of the very first trees I bought and have re-addressed them to varying degrees recently. 1999 I bought this tree at a garden centre and it was (mis?) labelled as a 'San Josa' Juniper. It’s some sort of semi-prostrate variety for sure and it could possibly be a San Jose. A week later, I went back for another one but needless to say, they had all been sold and I’ve never seen a similar one since. I was attracted by the well-formed trunk initially but the branches formed a big wide ”T” with the trunk at the top, some going left & some going right. The trunk is about 17cm high before it branches and I estimated the tree to be about 8-10 years old when I purchased it for £9.99/ $17.50. The juvenile foliage is extremely spiky but develops into the more familiar scale-like threads quite rapidly. Windswept and cascade are probably most beginner’s attempts at styling the first spindly juniper they acquire. The picture also shows my first attempt at jinning a branch. I lived with that styling for about 5 years until about the time I discovered the internet big time with the various bonsai forums and I realised I wasn’t a lone enthusiast. Becoming a bit bolder, I tried the cascade style in a cream octagon pot in March 2004 after doing a heavy wiring job on the left side branch and taking, what was for me, the radical step of removing a loopy under branch on the right. Up to that point I’d been convinced that all the branches had to fit into the design somewhere. I fiddled with the tree throughout 2004-2005 (in weird pots at weird angles) and posted it on another bonsai forum for an opinion. The tree looked worse than ever but I was determined to make the tree work. At very least I had been doing a little work with it every year and had managed to develop a good cascading branch. By late 2005 I’d been persuaded that the right side apex branch would have no place in a final design so I removed it in October 05, jinned the stub and put the tree back in the cream octagon pot. Growth on the tree had always been good and I had been pinching the foliage regularly over the years (the bonsai books said to, so I did). There were plenty of branch options on the cascade and the new challenge was how to incorporate the one remaining top branch into the design. So with heavy wiring I moved it to the left to join up with the cascade. I purchased a more suitable Walsall Ceramics pot in Nov 2005 but was very dissatisfied with the right angle bend formed by the trunk and cascade branch which gave it a very rigid look. The staff in the bonsai outlet thought the angle was great – no doubt hoping to persuade me to buy the pot! After 3 years of being involved in the internet bonsai forums, I had developed a good basic knowledge of digital photography and image manipulation using the associated software. I’d started re-designing my trees by virtually adding or removing branches, changing angles etc and began to play around with options for my juniper. As a result, I re-potted at a rather rakish angle in April 2006 after sizing it up in a “virt”. This made the jinned trunk more of a focal point and brought the still-problematical single apex branch into a more manageable plane as it was now part of the general “down and to the left” movement of the tree. By now I was starting to see a definite future for a tree that had started out as an impulse buy 7 or 8 years earlier. However, one thing was holding me back and that was the misconception that with a cascade (kengai) style tree, the tip of the cascade must always curve back toward the pot to finish under the apex and that there must always be some sort of informal upright type apex up top to work with.